Amid the recent departures and firings of senior administrative officials, Institute heads have pushed to recommit focus on the issue of ethical leadership. On Tuesday, Nov. 6, President G. P. “Bud” Peterson and other members of the administration communed at the Historic Academy of Medicine to host the Ethical Leadership: A Shared Commitment forum, which was attended by department heads and high-positioned faculty. This talk comes one week before Ethics Awareness Week, an annual effort by the University System of Georgia (USG) to promote ethical behavior that will take place from Nov. 11 to 17. This week features numerous activities focused on cultivating character and highlighting the themes of community, transparency and integrity. In the wake of troubling ethics concerns arising across Tech, replete with conflict of interest issues and abuse of Tech resources, the USG Chancellor Steven Wrigley on July 20 instructed Peterson to make several administrative and policy changes across Tech and to participate in the USG Ethics Awareness Week. Peterson is scheduled to give Wrigley a second update on progress made by Monday, Nov. 12. Peterson began his speech by restating the measures taken promptly following these scandals. Administration conducted personnel changes, created additional safeguards and altered the organizational structure of various departments by drafting distinct duties for each administrative position. Policy was changed so that the Chief Audit Officer reports directly to Peterson, while the Vice President of Legal Affairs was expanded to include Ethics and Compliance in its job title. The administration also revised existing policies to ensure they were compliant with Tech system guidelines, and made sure that no one individual can control the entire procurement process. Peterson discussed the abrupt increase in calls to the EthicsPoint hotline that has occurred in the past months. Since July 1, 2018, 140 calls have been made to EthicsPoint, an amount that dwarfs the 40 calls made in all of 2017. “It’s bad because we have a lot of issues we need to deal with, but it’s good that people are comfortable reporting things that they’re concerned about,” Peterson said regarding the hotline statistics. Peterson proceeded to promote Ethics Awareness Week, detailing his participation throughout the week of events. 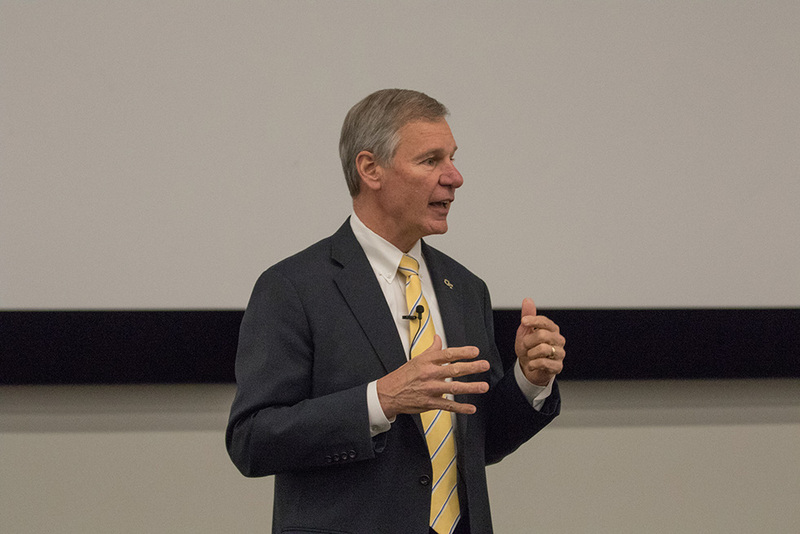 Three town halls facilitated by President Peterson will be conducted from Nov. 14 through Nov. 16 and various presentations will be delivered, including a Non-Retaliation Policy Presentation directed towards graduate students. Peterson says the Non-Retaliation Policy Presentation will address how graduate students can handle the compromising situations they might find themselves. Throughout the talk, Peterson repeatedly emphasized the difference between compliance and ethical leadership. On the question of what disciplinary action would be taken to address future mistakes, Peterson distinguished between making bad decisions and committing ethical violations. Following Peterson’s talk was a panel presentation by three panelists: Sonia Alvarez-Robinson, Executive Director for Georgia Tech Strategic Consulting; Aisha Oliver Staley, Interim Vice President for Ethics, Compliance and Legal Affairs; and Steve Salbu, Cecil B. Day Chair in Business Ethics at Scheller. The panelists discussed the characteristics of ethical leadership and culture while maintaining equality. Multiple questions arose from faculty members in the audience, including concerns on the disadvantages hourly workers face in comparison to high-positioned faculty and non-hourly workers. Faculty without a permanent position would take a risk when reporting unethical behavior. In response, the panelists highlighted the special obligation that tenured faculty have in reporting and speaking out when they see something questionable occur. Ethics week begins Nov. 11.